Funko has released new stuff for their upcoming WWE Pop Tees featuring a lot of classic WWE superstars and awesome matches including The Rock versus Stone Cold Steve Austin and its just in time for Wrestlemania 34 which was held in New Orleans! So while fan reaction for the greatest fan event has been positive to mixed, it’s still not THE best Wrestlemania. 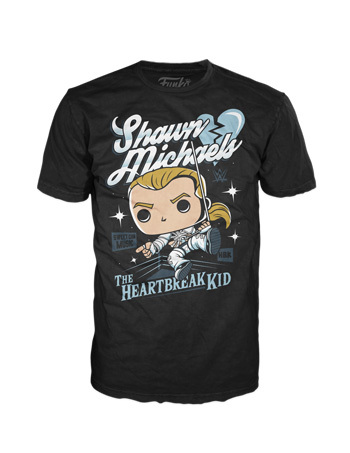 But before we get away from the main subject matter, let’s take a look at the WWE Pop Tees from Funko.. This was a classic moment in WWE history, also one of the proudest moment for the Heartbreak Kid, who also recently shared his new look after chopping off his ponytail. Seriously, this was an underrated feud from back in the day. 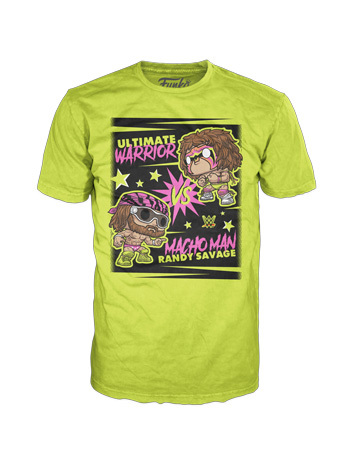 We have a neon green shirt featuring Macho Man Randy Savage versus The Ultimate Warrior. I’ll be sure to look up that match on YouTube and/or WWE network. Not a fan of the grey shirt but the damn print looks ooooohhh soooo fine. Sadly, supplies are limited with most of the shirts being available at the Wrestlemania Superstore in New Orleans. Hopefully, this makes it’s way to our stores. And please let it be cheap.